Jean-Luc Issler is head of the Instrumentation, Telemetry & Telecommand and Propagation department of CNES, the French space agency. A graduate of the Ecole Superieure d�fElectronique de l�fOuest engineering school (ESEO, Angers, France), he has been involved in the development of several spaceborne RF systems in Europe, for transmissions and/or navigation. He has also contributed to CNES research into optical telemetry and related standardization efforts. In 2004 he was awarded the Astronautics Prize of AAAF, the French aeronautical and space association, and in 2008 the EADS science and engineering prize of the French science academy for his work on Galileo signals and space borne GNSS systems. Jean-Luc also wrote an unpublished sci-fi novel in 1990, about the exploration of a Trojan asteroid by a probe with a solar sail. 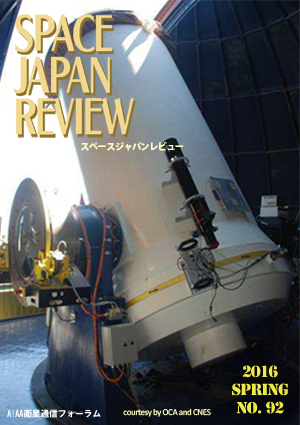 This column in the previous issue of Space Japan Review introduced the book about the high speed transaction of stock exchange. At that time, I, the reviewer, would like to review the activity of artificial intelligence (AI) in this field. But I would like to review this book since I am interested in learning the AI itself before that. As the cover of this book is in a mono-tone, it is impressed to be quiet. But the title of this book is very exciting. Although this book does not fan the exciting, there is a risk that mankind would be destroyed, if AI evolves. I understood that it warned anymore it was too late when we noticed it. The satellite communication seems not to concern to the AI, but AI is a basic technology for be applied to any field. I think that this book is appropriate to be taken in this column. However, as I am a layman in AI, it will be difficult to give good description for a whole matters. I would like to challenge as far as possible. This book review will include the reviewer�fs personal opinion. It is based on Japanese translation version of this book. "Usage of Space Technologies to National Security #2"